Hold the line as the rural serenity of French farmlands turns into all-out war. It’s seemingly serene, this lush French village and its pictorial houses, kissed by the sun and hugged by wall-climbing vegetation. But the scars of Arras run deep – and yet another World War is about to rattle the serenity. Together with Twisted Steel, Arras is one of the two Western Front maps depicting the Fall of France which eventually led to a British retreat from continental Europe. It’s inspired by the May 1940 battle that took place around the town of Arras, where the allied side launched a counter-attack against the German army, advancing towards the channel coast. In this rural area, you’ll see shades of the Soissons map from Battlefield™ 1 or even Harvest Day from Battlefield™: Bad Company. The environments are beautiful, but don’t stare too long at the magnificent yellows of the canola fields – enemy tanks or snipers may pick you off. Arras is about all-out warfare, meaning everybody will have a place and a chance to shine with their personal playstyle. There are open areas where tanks and planes will prefer to fight, but also hectic, infantry-friendly zones like the center of the map, where snipers can take advantage of the bird’s-eye view made possible by the church, the map’s highest point. For this setting (and for Battlefield™ V in general) we’ve got a killer tip: build Fortifications. On open fields, they give you the option to build trenches, which will be a much wiser way to get around than exposing yourself like a sitting duck. On top of creating new routes, Fortifications can block routes for the enemy, too. The third and potentially fourth day of the Grand Operation Fall of France take place on Arras (the other two days are played on the Twisted Steel map). New to Grand Operations? You’re in for a vast multiplayer experience that takes you across fictional in-operation “days,” where each day is represented by a round played on a combination of a map and mode. The actions you, your squad, and your team take on day one will have a direct impact on gameplay in day two, which in result will impact day three, and so on. If you’ve reached Arras in Grand Operations, you’ll start off by playing Frontlines. The tug-of-war combat of this mode can be described as a mix of Conquest, Rush, and Battlefield™ 4’s Obliteration mode. Here, both teams fight for control over one flag objective at a time, unlocking the next one to push the frontline towards the enemy base. Conquering the last flag opens the enemy base, making it vulnerable to planted explosives. The potential fourth day mentioned earlier will be playable only if the two teams are tied after the Frontlines round. This scenario triggers Final Stand, an intense bout on a shrinking playing field, where players need to fight to the bitter end with ammo and health almost depleted. Final Stand is extra dynamic on Arras; it starts off slow and almost peaceful in a vast area before transitioning to chaotic destruction as the area starts contracting, usually towards one of the city areas. There are six Capture Points on the Arras map when you’re playing Conquest. These flags are good to know by heart, no matter what game mode you’re playing. Starting with the A flag, we have a control point by a water mill, next to the river. Being a fairly open point, this can be a risky take, however with some Fortification work you can really set up shop here. Being the flag closest to the Axis HQ, it’s crucial for the German side to hold point B, the bridge, to get easy access to the E Capture Point. If you’re playing on the Allied side, you can shift the tide of the entire round by capturing this. Bring a well-organized squad and give it a go. You’ll experience a striking contrast of man-made steel beasts and natural beauty on this capture point. Get to this flag by crossing the canola fields or by taking the safe path through the river. The big, burning tank wrecks provide cover while you dig down and fortify your position. 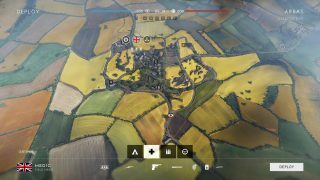 Take control of the hill farm on the northeast corner of Arras to obtain a strong position near the Allied spawn point. From here, travel the routes through the field to get to the Water Mill flag, or make your way into the village. An area where infantry thrives, this town center right in the middle of the map can get hectic. Bring your Submachine Guns and Shotguns and wreak havoc in the houses and around the cars. Make good use of the buildings and build a lot of Fortifications to succeed around this flag. Create new routes through houses and block normal routes for the enemy. The tallest point on the map, the village’s church is a beacon for everyone on the map and a great place for sniping. Vehicle fans can bring their tanks all the way to the east and capture this point. Alternatively, run over here as infantry and crouch down in the flowers. Take your time and dig trenches to allow easier access to (and from) the flag. Check out how to play on the rest of the eight launch maps so you’re prepared when you hit the battlefield: Narvik, Fjell 652, Rotterdam, Devastation, Twisted Steel, Hamada, and Aerodrome.